Camuy is a municipality of Puerto Rico, bordering the Atlantic Ocean, north of Lares; east of Quebradillas; and west of Hatillo. Camuy is spread over 12 wards and Camuy Pueblo (The downtown area and the administrative center of the city). The town celebrated its 200th anniversary in 2007.Camuy is part of the "Porta Atlántico" Tourist Area.HistoryCamuy also known as "La ciudad romántica" was founded in 1807 Petronila Matos, and formerly part of Arecibo is located in the northwestern coastal region of Puerto Rico, less than 5 minutes west of Hatillo on PR-2 and PR-119. 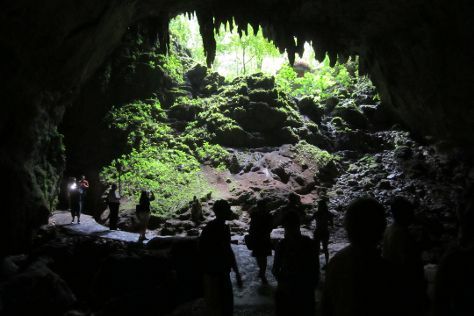 The name Camuy is known to be derived from the Taíno language, although a number of legends give differing explanations for the origin of the name. One such legend claims the name comes from the Taíno word for "sun", another claims derivation from camuy , Taíno for "beautiful scenery", and still another states that Camuy was the name of the Taíno chief Yumac with the letters in reverse order. The "sun" legend is reflected in the coat of arms for the municipality.In its beginnings Camuy was integrated into the Partition of San Antonio de la Tuna. The "partitions" were great expanses of land that divided Puerto Rico. This region today is known as Isabela, Puerto Rico. At the time the partition covered the areas between Aguadilla and Arecibo, what is known today as the municipalities of Camuy, Hatillo, Quebradillas, Isabela, Utuado, and San Sebastián. Camuy is in Puerto Rico. Customize your holiday with our Puerto Rico travel route planner to create an adventure that suits you.